By using an antenna to connect to FREE Broadcast High Definition TV signals - complemented by Internet TV and movies, people can easily save hundreds of dollars per year. Here is how to build an antenna system to receive free HDTV. First, go the website http://DTV.gov to study the maps and the television towers in your area. Enter your zip code in the top left corner of the page, see "Enter Location". Click Go!, and a TV station lookup for your area will appear. To learn where each TV station Tower is located, click on each TV Station Callsign - located in the left column, see "Click on callsign for detail". As an example, the DTV.gov web page pictured below shows that Zip Code 32780 has TV Towers mostly located in the (WNW) West North West direction. 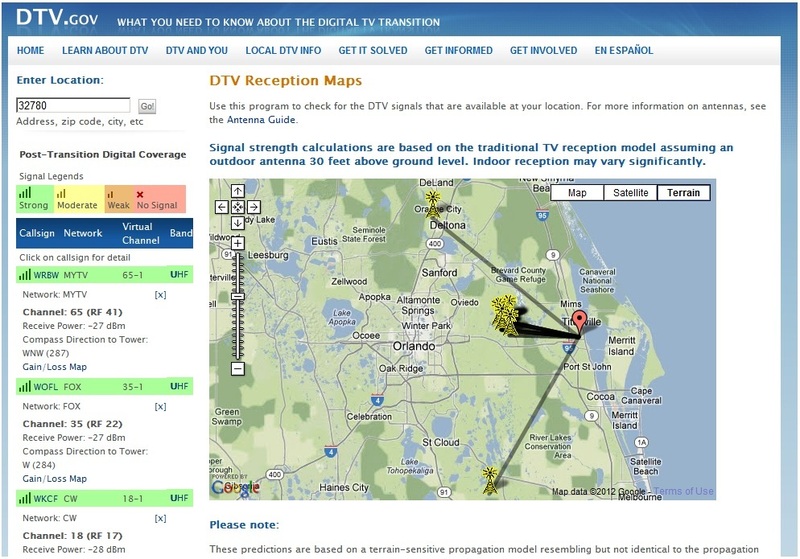 The DTV.gov web page is all you need to determine where the TV towers are located, and if the signal is strong enough to receive Free High Definition TV signals from an Antenna. As shown above, from location Zip Code 32780, the Antenna must point West North West. If the "Signal Legends" on the DTV.gov webpage indicate GREEN COLOR, "Strong", you should be able to receive these stations with an Antenna. We suggest installing the Antenna in the attic, if possible. If you can not install the Antenna in the attic, you will have to mount the Antenna outside your home. Some people are very creative about locating the Antenna. We have seen working Antennas mounted in garages, porches, skylights, lofts, and closets! Next, you must pick out an Antenna, and a Signal Amplifier. We provide working suggestions, but it is all up to you. Remember, Antennas are graded by "db Gain". Since the above suggested products are all from Amazon.com, be sure to pick items that are stocked at Amazon (Prime). This will save shipping charges, especially if you are an Amazon.com “Prime” member. By the way, you might consider becoming an Amazon Prime member NOW, for about $79 per year… because it offers free shipping AND free TV and movies via the internet. The Amazon “Prime” free movies are pretty good in my opinion. It is a good deal, and you don’t need any more monthly movie service bills! Sign-up for a Free one-month Amazon Prime trial here: Amazon Prime. When the Antenna, Signal Amp., Splitter, and cables arrive, start by installing the Antenna – pointing towards the TV towers, (the direction depends on your location determined by the DTV.gov web page). If you are able, and you have first studied all installation SAFETY requirements, find a spot to install the antenna in the attic on the side of your home facing the TV towers in your area. An antenna can receive a good signal thru wood and asphalt roof, but, concrete walls are difficult to penetrate. Try to find a location that only needs to read thru wood, if possible. Mounting the antenna in the attic will save you from “grounding” the antenna (from lightning storms), and, it will last many years in the attic. 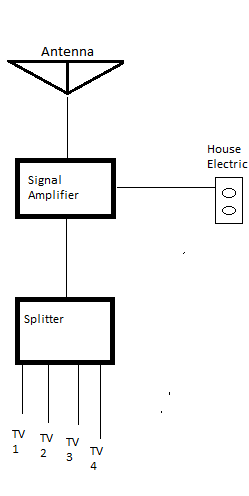 Remember the signal amplifier should be mounted as close as possible to the antenna, but, you will need to plug it in to a power source. My Signal Amplifier is actually located behind my main TV (with the antenna in the attic). The Splitter is used to run the signal to other TV’s in your house. The Splitter is wired after the Signal Amplifier, to all your TV’s. Please study carefully the instructions provided with your Antenna, and, all the Antenna accessories. We only provide the basic principles for you to understand the Antenna installation procedure. Please read and follow all precautionary safety statements provided with your Antenna equipment and accessories. WARNING! Please KEEP AWAY FROM POWER LINES. 2. Run an RG6 Quad-Shield Coax cable wire from the Antenna to the Signal amplifier. 3. Be sure Signal Amplifier is located near a home electric power outlet. 4. Run an RG6 Quad-Shield Coax cable from Signal Amplifier to Splitter. 5. Run the RG6 Quad-Shield Coax cables from the Splitter to all the TV’s.